Please excuse any unconvenience you might have during placing an order. Please ask for badges being placed on the numbered pages they might being sold. 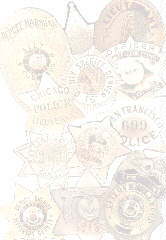 LAPD and NYPD badges are always available. Our web pages are offered to customers of the European countries where badges to own or to purchase is not restricted or prohibited. there might be restrictions onto badge deliveries. We do not deliver badges where it is forbidden to own them and we do not deliver any American badges to any country which is hostile to the U.S.A. ! Federal badges (if offered) are not available to the USA! But, we are not able to know the complete laws all over the world and if you will being able to order a badge and it is forbidden to own that in your country or local area, you will buy it onto your own risk and, if deceased by any reason we will not repay you or ship any replacement! IMPORTANT NOTICE TO ALL BADGE COLLECTORS OF THE UNITED STATES!! of defunct or merged agencies. that is legally authorized under Federal Law #106-547. Thank you !